To avoid further political conflict, broad agreement is needed on the best possible conditions for elections. By Baba Dakono for ISS TODAY. Mali is entering an electoral cycle comprising local and regional elections on 17 December and presidential and legislative elections in 2018. The announcement of the date for the local and regional polls kicked off an election period marked by uncertainties, including increased insecurity and polarised politics. Beyond the election result, these polls – and by extension the 2018 presidential elections – face several risks that need to be mitigated. The local and regional polls are to elect presidents of regions and cercles (administrative subdivisions) and the Bamako District mayor. The elections must be coupled with communal polls in the 59 localities where, for security reasons, voting could not be held in November 2016. These elections are a critical part of the implementation of institutional reform provided by the 2015 Agreement for Peace and Reconciliation. The agreement was signed in 2015 between the Malian government and armed groups in the north. For the first time in Mali, regional and cercle presidents will be elected directly by voters. In the past, they were indirectly elected by communal councillors. The reform advocated by the peace agreement aims to strengthen the powers of the regional presidents. However the Co-ordination of Movements of Azawad (CMA) – a coalition of Tuareg independence and Arab nationalist groups formed during the Northern Mali conflict in 2014 – is opposing the 17 December elections. Although the polls meet some of the political demands of the armed rebellion of 2012, the CMA – a signatory of the 2015 agreement – says other political reforms that are part of the 2015 agreement must be implemented. These include “operationalisation of the Interim Authorities, the organisation of the return of the refugees/displaced persons, the revision of the electoral lists, the review of the laws governing free administration and the code of the Territorial Collectivities and many other related aspects”. Mali’s political opposition also says the material conditions are not satisfactory for credible elections, and is demanding the audit of the electoral register. These obstacles to peaceful polls come against the backdrop of the suspension of the referendum procedure to revise the constitution some months ago after weeks of disagreement between supporters of and opponents to constitutional reform. In terms of security, the killing of a village chief’s adviser in the Mopti region on 7 November, and that of the village chief of Kerena in the Douentza cercle in November last year, highlight the aggression in the fight for local chieftaincy. Jihadists including the Group for the Support of Islam and Muslims are also threatening to derail voting in the areas where they are active. Besides this, citizens must fight off growing networks of criminals such as highway robbers and cattle raiders in the northern and central regions on a daily basis. 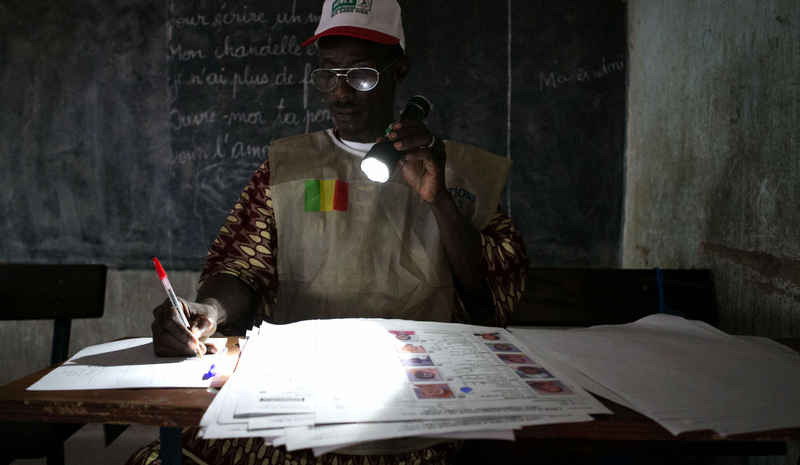 Mali’s elections also face several operational challenges. These include the uneven presence of government throughout the territory and the return of refugees and displaced persons. According to the United Nations Refugee Agency (UNHCR), there were still some 143,103 refugees and 58,594 internally displaced people at the end of June. In 2013, according to the UNHCR, there were 167,000 refugees and 283,000 displaced people. The elections also pose a possible institutional crisis in Mali. President Ibrahim Boubacar Keïta suspects the opposition wants to hamper the organisation of the polls in order to secure a power-sharing agreement through a transitional government. Meanwhile the opposition believes the president is using the security risks as a pretence to extend his stay in power beyond the limits of the constitution. The security situation is unlikely to improve before the upcoming election, and so the regional and local elections on 17 December are a test ahead of next year’s the presidential and legislative polls. An inclusive framework is needed for political actors, civil society and the signatories of the 2015 peace agreement to discuss and agree on the best possible conditions for elections – which will be inevitably flawed but still credible. Alternatively they could agree on a postponement. A shared view is undoubtedly the best guarantee that the parties won’t take advantage of the shortcomings of the elections to contest the results. A political arrangement such as this made it possible in 2013 for the presidential elections to take place after the crisis in Mali and the Franco-African intervention. This crisis resulted in an armed rebellion in the north and a military coup followed by a political transition in Bamako.